A smartphone that delivers both an astonishingly large screen and a super slim body that you can hold in one hand. The Xperia™ Z Ultra features a large 6.4-inch screen that pushes the boundaries of smartphone size to its utmost limits. You can enjoy a wide range of big screen entertainment and communication. The stunning 6.5mm thickness makes it comfortable to hold in one hand. Big size – Big entertainment. 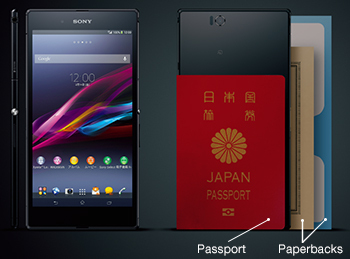 Designed to be the same width as a passport, it is perfect for sliding into your pocket. The super-slim design fits in a suit breast pocket without any unseemly bulges. The Xperia™ Z Ultra is equipped with a camera that automatically takes stunning shots with the optimal settings in any situation, even in challenging lighting conditions such as backlighting or in a dimly lit location. The camera comes with an abundance of functions for taking artistic photos with different effects or sweeping panorama images of crowds or landscapes. The Xperia™ Z Ultra also supports a range of apps for taking and editing images. You can enjoy the world of augmented reality, adding effects to scenes, or use the amazing high-speed continuous shooting to capture multiple images and select your favorite one. * Camera apps must be downloaded from the camera menu. Use of Wi-Fi communications is recommended. * Settings must be configured in advance. The large screen delivers the most immersive viewing experience imaginable. The Xperia™ Z Ultra incorporates the bright and vivid TRILUMINOS® Display for Mobile, powered by the X-Reality® for mobile picture engine using Sony’s unique super-resolution technology, making viewing your favorite photos and videos a deeply immersive experience. If you love listening to good quality music, you will discover new appeal of your favorite artists with the Clear Audio+ high sound quality setting in the WALKMAN® app. Up to 100 hours of music playback time*1. Enjoy music entertainment anytime, anywhere. *1When using the WALKMAN® app. May vary depending on actual usage conditions. The large screen opens up a whole range of possibilities. The large 6.4-inch screen is great for reading books and magazines. The Full HD display delivers crisp, clear text. The Xperia™ Z Ultra lets you read a magazine or book anytime you like, anywhere you like, without having to carry it around. You can check photos that you have just taken or enjoy your favorite movie with friends. The Xperia™ Z Ultra’s display is big enough for viewing with friends. * A subscription to a data (packet) flat-rate service is recommended. Entering text on the large screen is incredibly easy. And not just key input, but writing or drawing with the ES22 stylus pen (sold separately) in the large input space is as easy as writing on paper. Great for taking notes or writing memos. Supports 4GLTE 800MHz platinum band. Supports GLOBAL PASSPORT LTE, GSM, and UMTS. Also supports "1Seg/Full Seg", "Osaifu-Keitai® NFC (Felica integrated)" , "NFC ", "infrared communication ", etc. International standard for near field communication. Cannot be used as a remote controller.